A great way of using any firm white fish, especially if you have odds and ends which is fairly typical of my fishing. I rarely come home with anything capable of producing four large neat fillets which is what many recipes call for. You can vary the heat with this, from simple herby-citrus to a nice tingle. The ingredients list looks a lot but the recipe is very simple. If you make up the fish marinade, guacamole and cream sauce ahead of time you could easily make this in the boat with the freshest fish imaginable. Follow these quantities for one or multiply up for several. Juice the lime, chop the coriander and mix 2 tablespoons chopped coriander, half a clove of crushed garlic, half the lime juice, a tablespoon olive oil and pinch of salt. Put this marinade in a bowl and mix in the fish. Leave alone for about 15 minutes. Meanwhile mash up the avocado, another tablespoon of chopped fresh coriander, the other half of the lime juice, chopped red onion, quartered cherry tomatoes and a pinch of salt. It can be as smooth or lumpy as you like. Yes, you have just made guacamole. Now make the cream sauce. Mix mayo and sour cream in proportion one third/two thirds, add in crushed garlic and hot sauce. Quantities and proportions to your taste! Two tablespoons of the resulting sauce per wrap is a good guide. Now go back to the fish. You can either fry on a hot griddle pan or grill, either way cook until white all the way through, a few minutes only. Now assemble: on your wrap put a bed of salad leaves. Shredded iceberg lettuce is fine or you can go fancier. 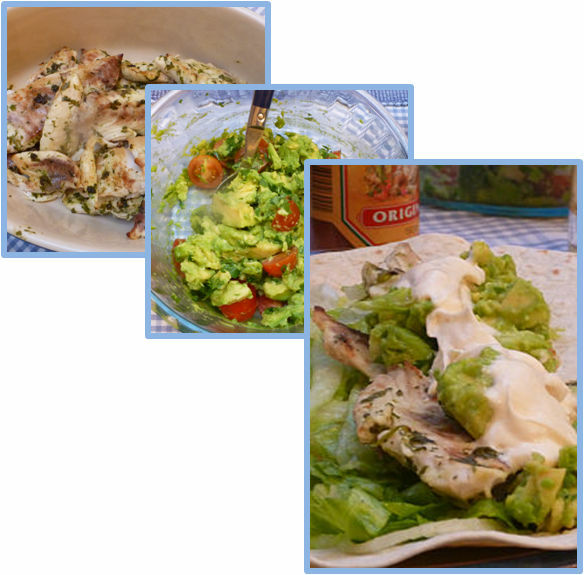 Then a layer of guacamole, then the fish, then a good blobbing of the spicy cream sauce. Either roll up and eat messily with your fingers or eat daintily with a knife and fork. If you have under-done the hot sauce you can always lash on more. Very cold Mexican beer is the perfect accompaniment.